When my mom asked me if I could watch Brianna while she went to HomeGoods, I agreed. Well, it’s not like I had a choice, but still! Mom said that she wanted to pick up some things to redecorate the living room with. I figured she wouldn’t take long, so I knew I could wrangle Brianna for the hour Mom would be gone. But not too long after Mom left, I heard a thump in my room! I ran upstairs and found Brianna sitting on my bed. But when I saw a roll of toilet paper sitting right next to her, I almost FLIPPED OUT!! Let me back up and explain. For some reason, Brianna’s been using toilet paper whenever there’s been a BIG mess! I’ve tried explaining that paper towels are better for cleaning up, but she refuses to listen. And it’s not like Mom or Dad really care either! They’re just glad she’s started to clean up after herself!! Anyway, not only did she have her big-mess toilet paper, but she was also in MY room! “Brianna! WHAT are you doing in my room?” I exclaimed. But Brianna looked at me as if I had grown two heads. “I’m standing in your room with a roll of toilet paper, Nikki.” Then she rolled her eyes at me. That girl has some NERVE!! But I ignored her little attitude because I was still worried about where her mess was this time. “Mom said I could help redecorate downstairs. Wanna to see what I did?” she giggled. I was kinda nervous to see Brianna’s redecorating skills, especially since she was holding her big-mess toilet paper. But if she wanted to show it to me, that meant the mess wasn’t in MY room! But, little did I know that Brianna was using her big-mess toilet paper to create, well, A BIG MESS!! The living room looked like that time Chloe, Zoey, and I were involved in the Great Toilet Paper Caper after New Year’s! Let’s just say that MacKenzie’s house did NOT look too great once we were finished toilet-papering her front yard. And when she caught us, she REFUSED to believe that my friends and I could do something so sinister! And I felt EXACTLY how MacKenzie must have felt!! How could Brianna do something so sinister?! There was toilet paper dangling from EVERY surface in the living room! It was all over the sofa and the coffee table. It was even hanging from the ceiling fan! I couldn’t believe the little brat had redecorated the entire room…WITH TOILET PAPER!! I was so shocked I couldn’t even form words. I just stood there with my mouth open staring at Brianna’s work. “I got this idea from when I went to Amanda’s birthday party. There were lots of pretty streamers hanging from the ceiling and walls! I was trying to do the same thing because it was so beautiful. But for some reason, it just doesn’t look right. I’m worried that Mommy might not like it! I think we need colored toilet paper…” Brianna suggested. And I agreed with Brianna, Mom would definitely NOT like toilet paper hanging all over her living room! Then I had a WONDERFUL idea!! Okay, maybe it wasn’t wonderful but I was desperate! Mom would be home soon and the living room looked like a messy toilet paper factory!! So I grabbed the closest sheet of toilet paper and motioned Brianna over. Then I showed her how to twirl the toilet paper around in order to create a toilet paper rose! I guess having a random origami phase DID come in handy!! And I must say, the roses were turning out really good! Plus, they were doing their job and keeping the little brat busy. While Brianna made some more roses, I gathered up the rest of the toilet paper from around the room. I must have looked like a tornado of arms because of how fast I was moving! Since I had no idea when Mom would be back, I knew I couldn’t rest for one second. And lucky for me (and Brianna, too! ), Mom got home right as we finished. I couldn’t believe it!! “Hey there, girls! How have—oh my, did you make these? !” Mom picked up a toilet paper rose to admire it. 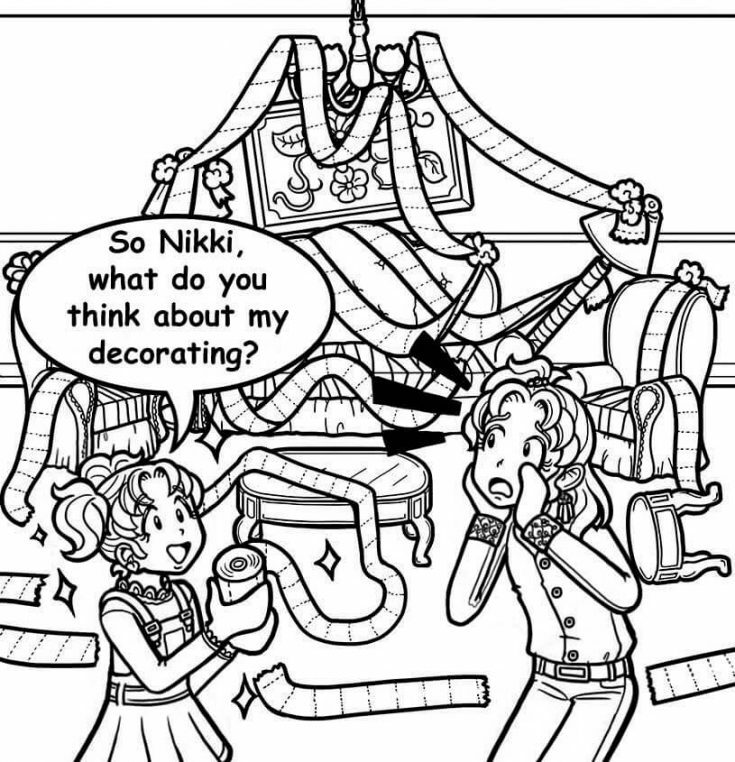 “Yeah, I wanted to help decorate so Nikki showed me how!” Brianna exclaimed. Are you into making stuff like paper roses? How about cootie catchers or braided bracelets?! Please share your crafty ideas in the comments—I might want to try them out! Nikki, you are right. So anyone who read this, you can follow Nikki’s advice to help you solve the toilet-paper mess. Sometimes, this may be a very huge now like your baby brother/sister had made an 11,090 toilet-paper mess. My Crush gives me ORIGAMI!!!!!!!!!!!!!!!!!!!!!!!!!!!!!!!!!!!!!!!!! I have a sister that drives me crazy and she was like the most annoying person ever!!!!!!! I know how to make a piano out of paper and more stuff. Nikki, you are such a good problem solver and sister! Never would’ve thought of that! And Brianna is just so artistic! She is going to have one heck of a career someday! I know how to make fortune tellers paper boats and rubber band bracelets.